The slopes of Bryn Maenhiri play host to a portal that opens to the Otherworld, the lands of Faery, and possession of it brings men powers untold. So the tribes of men waged war with one the other to hold it; until their battles brought forth an otherworldly host from the lands Faery, elves, fey, terrible and wonderful, wild men of the woods, giants and other such horrors. In countless battles the four realms struggled to take hold of Bryn Maenhiri, where too often the deep green grasses know the warm stain of blood and the iron of shod boots. In time the other worlders sent forth their champion, the elf-lord Eifion, and he carried with him the sword Haearndarian. With this blade few could stand against him so that he fell upon the luckless with wild abandon, slaughtering men in droves. But in the end, his vanity undid him and he fell, his blade shattered by the heroes of men. The host of Faery fell back into the hill and upon the red soaked field the three kings of men made peace with one the other and swore a pact to keep the hill closed. They each took a shard of the sword for safety. So peace came to the whole of those people. But now the shards have gone missing; stolen by some unknown hand and war spreads across the lands. Fear grips men for rumors of a host of fey returned spreads through whispers in every household. Bloody war and murder grip the hearts of men. 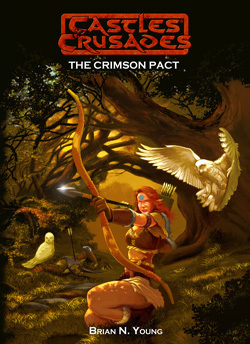 The Crimson Pact is a hard hitting adventure module that pits any would be adventurer against a veritable host of problems that hard sword strokes alone won't solve. Crimson Pact is designed for use with mid-level characters and for play over several gaming sessions.